Industrial Light and Magic (ILM) has revealed a short trailer for an experimental new game for HTC's Vive Virtual Reality headset. The company is calling it a "cinematic virtual reality experiment", and it is coming directly from the company's "ILMxLab" - a skunkworks designed to experiment with new immersive technologies. In other words, it appears that Trials on Tatooine will essentially be a proof-of-concept tech demo dressed up as a game. But that isn't to say we shouldn't be excited. 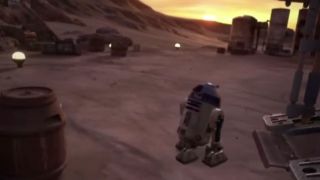 As VentureBeat reports, in the game you'll get to interact with R2D2, swing your lightsaber, and do battle with stormtroopers. Saber combat should be particularly intriguing, as it will make use of the Vive's widely praised motion controllers - so fingers crossed it will actually feel like you're in the midst of battle. The move is also potentially indicative of how developers will be taking sides in the forthcoming VR war. Winning the support of ILM, and thus the Star Wars Universe is sure to be a boon to HTC's offering when it goes up against the Oculus Rift, which also launches imminently. The news also couldn't be better timed, with the Vive due to hit on the 5th April - though at launch it will cost an eye-watering £689 ($799 US/$899 AU). You can find more on the Vive launch here.